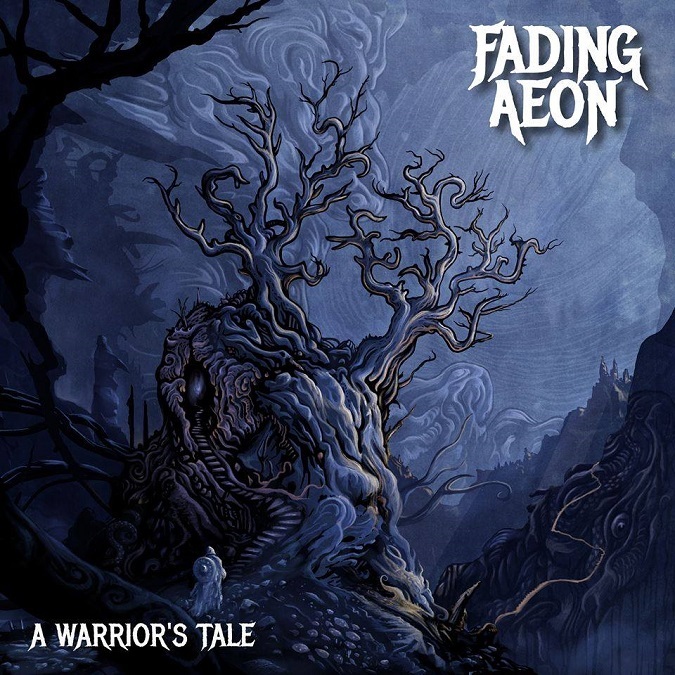 This time, it was guitarist David Gareis, from Kronach, Germany, whose melodeath band FADING AEON was just about to release their indie début, ‘A Warrior’s Tale‘ (out January 6). David’s cousin Patrick Gareis is on drums; Christian Stauch sings and handles bass duties. Much along the epic lines of Wolfheart, FADING AEON delivers a five-track album based on a central theme – “a warrior who dies in a desperate battle trying to save his family and tries to find his way to Valhalla after dying,” as David described it. And in those five tracks, the band tells a succinct and moving tale. So the opener, “Fear My Name,” has Death introducing himself, saying he will not be stopped, warning that there is no salvation in death, only damnation. The slow breakdown is lovely, with piano and tasteful drumming, and there’s almost a Middle Eastern feel in the chorus. “Tonight We Will Rise” is a standout, atmospheric and defiant and catchy (think HammerFall), with a stirring, galloping groove and heady guitar riffs. This is the warriors beginning their quest with joy in their hearts, even though they know it’s a lost cause. The apex of the theme, the crux of the story, is “One Last Farewell.” As he faces his end, the warrior turns his life’s choices over in his mind, and the lyrics and music parallel his mental turmoil. He hopes his family is spared, but mulls that maybe he will see them in Valhalla – and here, the musical tone lifts and brightens. He realizes how awful that thought is (“I must not think this way / How could I ever be so selfish”) – after all, they would have to die to do so – and comes back to his senses, as it were. The last two instrumental minutes are a resolution: he has given up the fight at last. You can see the ravens circling over the battlefield in your mind, feel the cold wind sighing through the blood-soaked grass… yeah it’s that evocative. “Beyond the Veil” is the start of the warrior’s journey to Valhalla. He finds himself in a sort of purgatory. He decides this is a test bestowed by the gods to test his courage and he’s beset and tempted by voices of doubt (“You can’t leave our realm behind,” “Access to the Hall denied,” they whisper). It’s marked by Maiden-esquely melodic guitars and a very folky chorus in 6/8 time. “The Journey Ends” is, well, the end. Our hero has reached his hoped-for destination, and indeed the music brightens again, a mix of joy and sadness. He recalls the painful trek to get there (“I fought, I bled,” “I entered the nightmares’ realm and accept / That all of those sufferings were meant for me / To endure them was my destiny”) and knows his family survives. He has done his best and can rest in peace. The chorus is soaring and glorious, boosted by a delicately picked, fluid guitar melody. The folk-influenced part before the last chorus is stellar, set off by pipes and fiddle. The finale is still defiant and proud and the outro wraps it up perfectly, with violin and guitar duetting to a gorgeous close. ‘A Warrior’s Tale‘ is beautifully self-produced, crisp, clean, and well-defined. Admittedly, the vocals could be pulled out of the mix a little more to fully get the gist of the story, but that’s a small critique. Heavily influenced by classical music (David is a fan of Beethoven, he tells me), the tracks go through very definite movements, returning to themes both musical and lyrical. They are long for sure – nothing is less than six minutes and most tracks near 10 – but you never get the feeling they could use an editor. Every section makes sense and leads logically into the next. It’s really great to see a young band come out of the womb fully formed, if you will. It’s been just five years since they started as a hobby in 2014, but FADING AEON is poised to take it to the next level.